George Mason University's South Korea campus. A couple of years ago, George Mason University received a by-invitation-only opportunity to expand its operations overseas when Songdo Global University came a-courting. 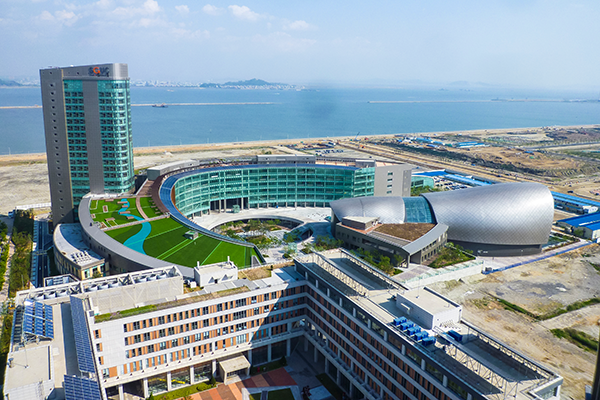 Songdo is a new and growing conglomerate of institutes of higher learning located about 35 miles from Seoul, South Korea. So far, the State University of New York, the University of Utah and Ghent University, along with South Korea’s Yonsei and Incheon universities all have branches on the campus. The well-regarded music school, the St. Petersburg Conservatory, is expected to be the next to arrive. Mason Korea, at least for now, is small and self-sustaining and uses no Virginia money. Courses are limited to global affairs, management and economics. Its first class was offered just last spring. All of its students will spend a year abroad at one of Mason’s Northern Virginia campuses. Mason is taking it slow at Songdo, perhaps keeping in mind its previous attempt at an overseas operation in the United Arab Emirates. That effort was unsuccessful in attracting students and closed in 2009 after just three years. Mason’s first Songdo class has only 34, mostly Korean, undergraduates, though this fall semester’s class is expected to reach 200. Simmons envisions as many as 1,000 students at Mason Korea in five to 10 years.